Fuerst Gemini, our young “Prince”, is a repeat crossing of Fidertanz with Ditana. His gorgeous sister from 2008, Free To Be, convinced us that we should try the recipe again. Fidertanz is a pre-potent sire who won both his 2004 Westfalen licensing and his 30 day test at Neustadt-Dosse; then at the 2005 Bundeschampionate he finished second, scoring 9.5 for conformation, 9 for trot, 9 for canter, 8 for walk , and 9.5 for rideability. 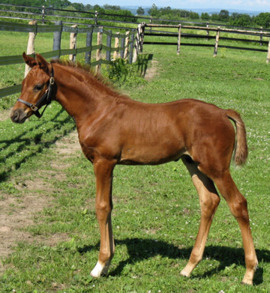 Most signifigant, Fidertanz was chosen Altpremiumhengst in Oldenburg in 2006 based on the excellence of his foals! UPDATE: Fuerst Gemini was selected as Champion Hanoverian Foal 2009, from an illustrious crop of 18, and designated a Dressage Stallion Prospect by Dr Ludwig Christmann. This very special dressage colt has been SOLD to Carolyn from Ottawa.